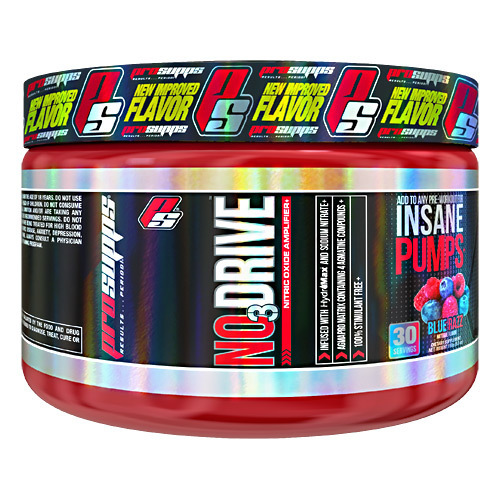 ProSupps NO3 Drive is a stimulant free formula with 3 Agmatine compounds. Advertências: Not for use by individuals under the age of 18 years. Do not use if pregnant or nursing. Keep out of reach of children. Do not consume this product if you have a medical condition and/or are taking any prescription medication. Do not exceed recommended servings. Do not use this product if you are at risk or are being treated for high blood pressure, kidney, thyroid or psychiatric disease, anxiety, depression, seizure, enlarged prostate or stroke. Always consult a physician before beginning any supplement or training program. Keep out of reach of children. Notas: Contains milk. Contains 0% juice. Gluten free. Recomendações de uso: As a dietary supplement, mix 1 scoop with 6-8 oz of cold water. Consume 15 to 30 minutes before exercise. NO3 Drive is formulated with ingredients that have a tendency to clump. The quality and efficacy of the product are not compromised in this condition. Enjoy the pumps by taking the clumps!